Memory does interesting things to us. For some, it’s the process by which we as humans (certain animals too, I suppose) react to the world around us, encoding, storing, and later retrieving some stimulus to our consciousness. To those of us grape fans, it either builds up a great bottle or dismantles some less-than-stellar bottle of something you had years ago. Memory is many things, and fickle prime among them. 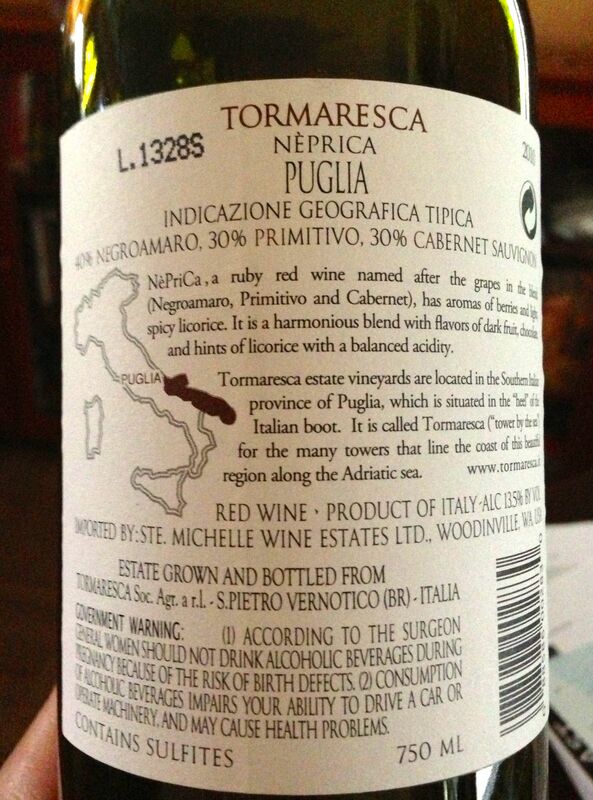 2010 Tormaresca Neprica Red Blend Puglia, Italy. Take this 2010 Tormaresca Neprica Red Blend Puglia, for example. I know we had many bottles of the Neprica over the last couple years–perhaps even a case?–and I had always thought it very equal to the task. Better than equal, even, and bet you could find earlier posts here in Notes that substantiate this vibe. But that’s just my memory of the Neprica, as I haven’t had one in almost a full calendar year. This week, however, I uncorked this last bottle of red blend to sample after work. On one or two occasions, the glass may have even carried over to our dinner meal, but I think it was mostly consumed just on its own merits. A good beverage, to be sure, but not quite up to all the praise I had offered in 2012. To some extent, I think wine tasting is about context. That great Cabernet goes to another level when you have it with great company and/or a great steak dinner. The amazing Pinot Noir works well in part because of your food pairing, but perhaps in part too because you had a less worthwhile red the last time out. That’s sort of the case here too with the 2010 Tormaresca Neprica: I’d now call it average, partly because my palate is slightly more attuned than last year, and in part owing to the great wines we’ve recently enjoyed and cataloged in this blog. The Neprica is still full and delicious…I’d just say that it perhaps lacks some of the nuances and subtle spice notes that I’m enjoying in the Bordeauxs, Cabs, and Pinots we have sampled more recently. Last thought–I’ll like my next one, and it’s a good value. This entry was posted in Cabernet Sauvignon, Red blend and tagged Italy, red blend.